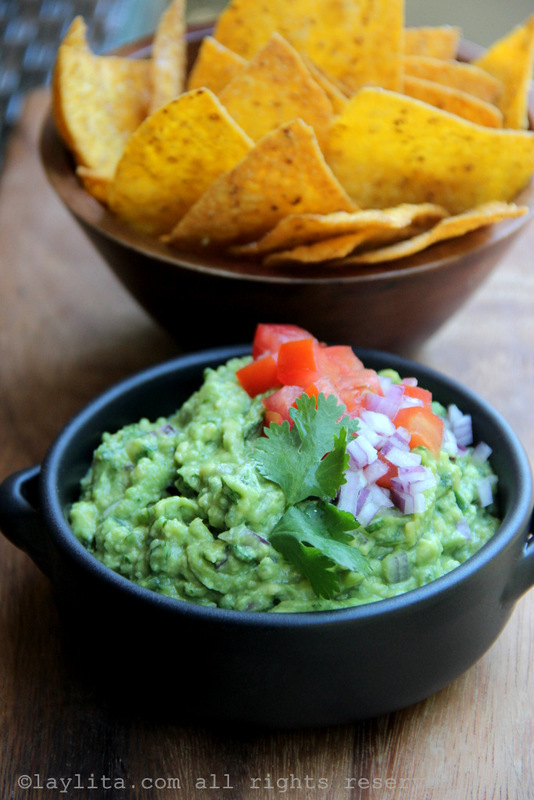 This is my simple and delicious guacamole recipe made with avocados, lime, onion, serrano peppers, garlic, cilantro and lime. 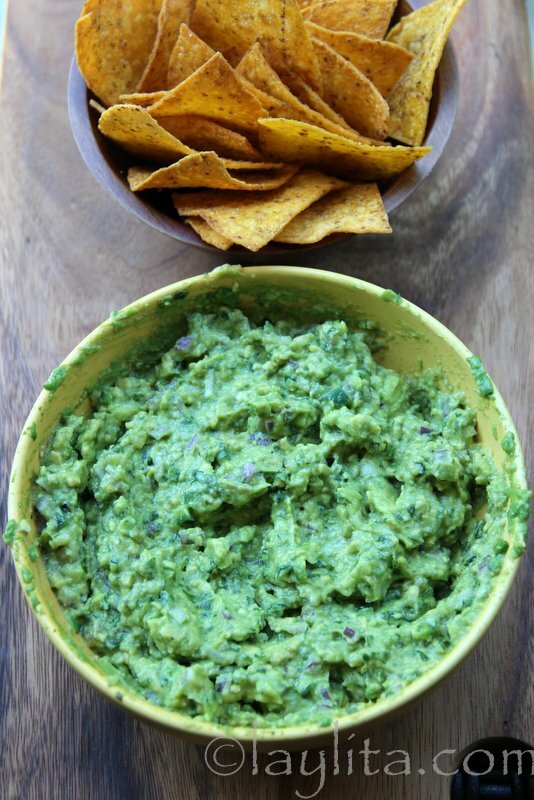 I love guacamole. It is one of my favorite snacks. 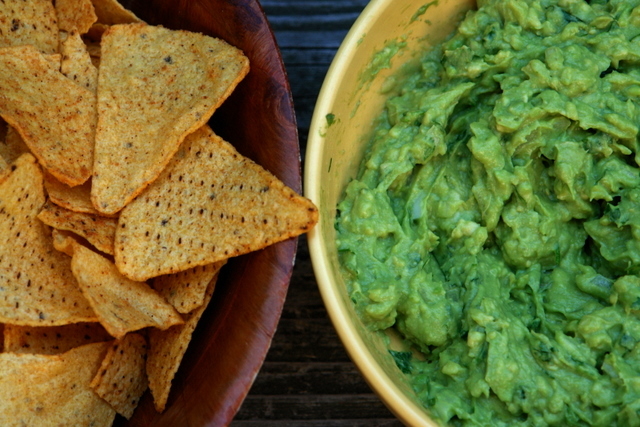 I have some of the best memories of my mom, who grew up in New Mexico and makes great Mexican/Tex-Mex food, making these huge bowls (think salad bowl size) of guacamole that we would eat until we were completely full (and we would always finish every single bite). I’ve mentioned before that when I was a kid in the south of Ecuador we didn’t have any Mexican restaurants anywhere close. Most of my friends had no idea what a quesadilla or an enchilada were and discovered these thanks to my mom – my friends loved to hang out at my house, in part because they knew my mom would cook some good food (of course I loved to hang out at my friends’ places to eat their moms’ food). Slice the avocados lengthwise and remove the seeds. 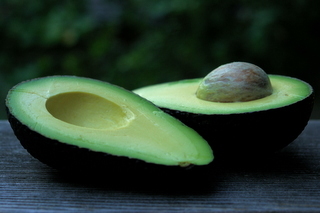 Use a spoon to remove the avocado flesh, place it in a large bowl, drizzle the lime juice on top, and mash the avocados until pureed, I like to leave a few small chunks to give it some consistency. Add the diced onion, peppers, crushed garlic, chopped cilantro, tomatoes (if using) and salt to taste, mix well and serve immediately as a dip with chips or a side dish. One thing that drives me crazy is that sometimes it seems impossible to find decent guacamole at restaurants. I use the quality of a restaurant’s guacamole to judge whether I’ll go back or not, seriously it’s just avocados, limes, onion, cilantro and salt, how hard is it to mess that up? I have to mention though that my favorite fast food place, Chipotle, has some of the best guac you can get at any fast food restaurant. It’s fresh and simple: avocados, onions, hot peppers, cilantro, and lime. So if they can get right why can every other Mexican or Tex-Mex restaurant do the same? The other thing that annoys me is that the places that actually get it right are so freaking stingy with the guac. In my opinion it should be automatically included as a side on all dishes, but it usually isn’t and you have to pay an extra $5 to get some. Good thing I don’t eat out too frequently and just make my own guacamole at home. And, yes, I let everyone eat as much as they want. I try to keep it simple and don’t usually add tomatoes unless I’m running low on avocados and need to maximize the amount I’m making – or I just a some diced tomatoes on top or on the side for those who want them. My mom always added garlic to her recipe and I like the taste it gives it, but feel free to leave it out if you’re not a garlic lover, same thing for the serrano peppers. 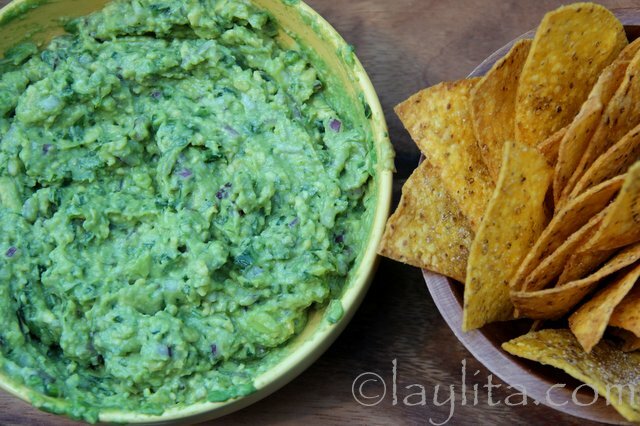 I used this recipe to make guacamole for the very first time this week. It was AMAZING. I completely know what you mean about the restaurants failing on a simple dish. I thought I didn’t like guacamole due to a disappointing serving a tried at a restaurant once a long time ago. I finally tried it again at a different restaurant and realized that it can be delicious, however, this recipe even beats that! 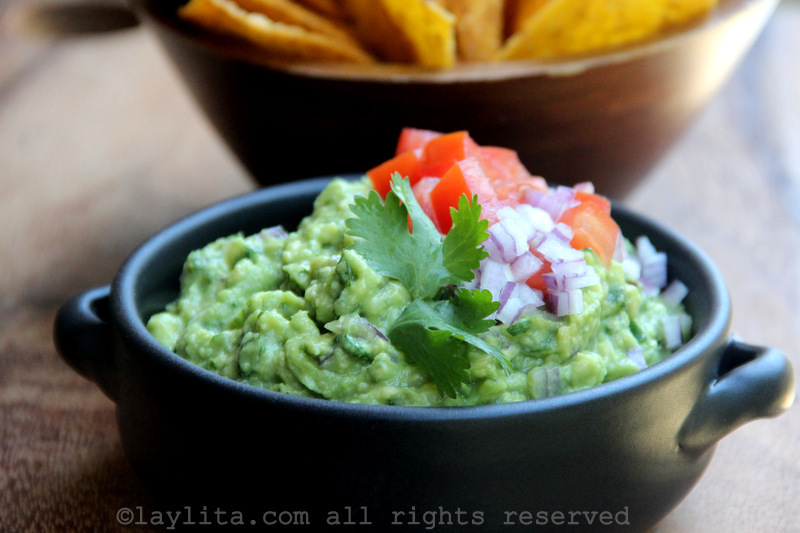 Thank you so much for sharing this recipe and for including the tip about keeping the avocado seed in the guacamole. I did that and kept it sealed in my fridge for the 4 days it took for me to eat it all and it stayed super fresh and vibrant! I made this today with my friend and we ate most of it between the two of us. This is my new favorite recipe! Thank you! 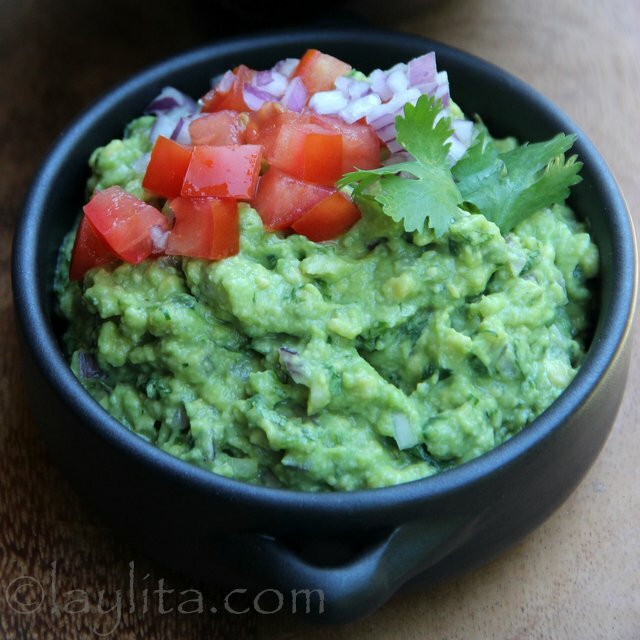 I just made guacamole following your recipe and it is delicious! I love it! The chili peppers are a must. That’s one thing the restaurants don’t add enough of! 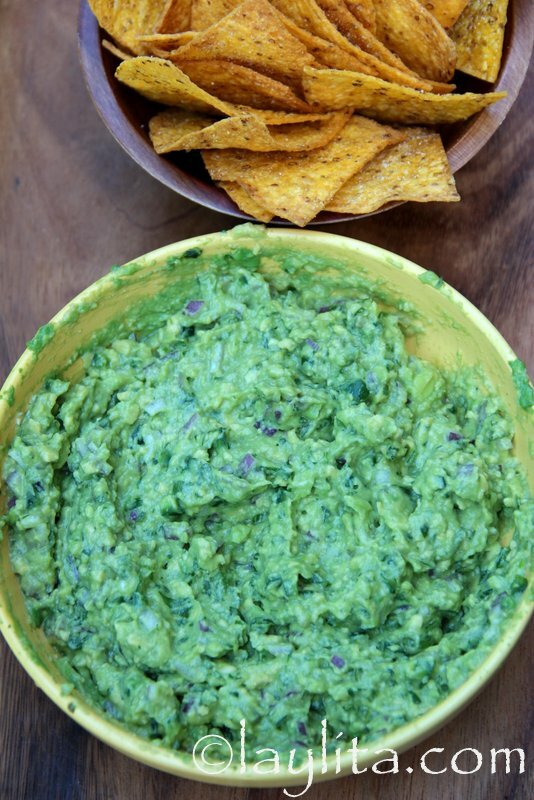 I love simple guacamole as you’ve shown, but I also love it mixed with lettuce, tomato and (cringe) mayonnaise! My mom would make the “poor man’s version” i.e. mayo-guacamole version with “poor man’s” taco’s or taquito’s. “Poor Man” meaning she would make the taco’s with ground beef or the taquito’s with canned corned beef. I know it sounds disgusting but it is delicious! 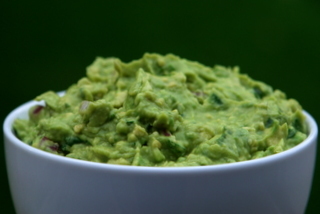 I agree regarding your restaurant comment… Guac should be added to all plates at no additional charge! Oh and I do like it simple like you make it! That is how I do mine. The garlic helps make it. I think restaurants are using cheaper avocados and/or being stingy and trying to make it go further by adding (I cringe to say it) mayonnaise! Yuuuuummmmm!!!! I could eat whole large salad bowls of guacamole every week! I cannot see it and not want tons! I can’t tell you how homesick this makes me. We just moved to the SF Bay Area this week after 30 years in San Diego. 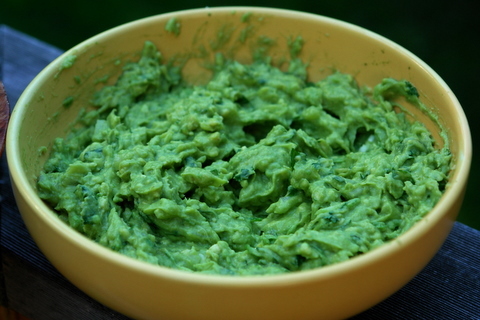 I had a Fuerte avocado tree in my backyard for years and we made guacomole almost daily. Thanks for the post. Delicious and comforting. I’ve never mailed any so I’m afraid I don’t know how well they would do, maybe if you had the special packaging that is used for overnighting seafood/meat. You might check with a courier company, they probably can provide guidelines for mailing perishable items. Loving your website! Being of Ecuadorian descent, born and raised in NORTH America and having SOUTH AMerican blood I grew up with my mothers most amazing Ecuadorian dishes. I firmly believe plantains are the fountain of youth! Anyway, my mom makes an INCREDIBLE gauacamole! Same ingredients, but more like the ceviche base but without the concha, shrimp, tuna, fishes, etc. Just as if you were preparing ceviche – lots of lime juice – OIL – salt, pepper, tomatoes, favorite onion, cilantro and sort of chunky, not too pasty avocado mash. Forget mincing cilantro or the onion, the chunkier the better! I’ve had almost all Ecuadorian food and I have still many dishes to enjoy. The key to authentic – Ecuadorian hands or supervision – don’t make it elaborate or fancy of foofooshishu or exotica ala “Americhhann” (you know what I mean) – dont worry about fat or salt – if you do it right its tasty and ultra healthy. I’ll be reading more! 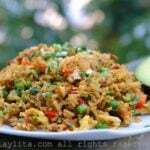 Thanks Laylita for sharing our foods! 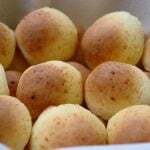 I just want to tell you that I’m going in a week for a holiday with my family and am going to prepare a full Ecuadorian meal/evening for them just from recipes from your blog here. For sure I’m making the fish in coconut sauce and probably this guacamole. Also a salad. Do you have any suggestions for a traditional Ecuadorian cocktail to go with it? I’m *thinking* of trying your sweet empanadas but using blueberries vs. raspberries only because I will be in the State of Maine where blueberries are abundant. What do you think of that? Thank you so much for everything you put in to this blog..I visit it all the time for the eye candy and inspiration..I love it! Hi Katie – I know quite a few Ecuadorian cocktails but most are for cooler weather (I grew up in the highlands so we we’re always looking for drinks to warm us up), but I remember a good cold one that we used to make with my friends: take a can of condensed milk, passion fruit juice and sugar cane alcohol (aguardiente or cachaca, can also use white rum since it’s easier to find), blend them with a little bit of ice and serve garnished with a few passion fruit seeds. Also, we like to borrow drinks from our neighbor countries, I especially love caipirinhas and will post a recipe for a pineapple cairpirinha in the next few days. For the empanadas, I think that blueberries will be great! Good luck with the dinner, I’m honored that you’ll be able to use these recipes! Your blog is amazing! How fabulous and divine are your pictures! Great job and thanks for dropping by mabletan.com. Good luck with the quiche. P.S: I love the Rhubarb puffs. They look absolutely amazing! Gorgeous! There is nothing fresher and more addictive than guacamole! And you’re right–restaurants never give you enough. 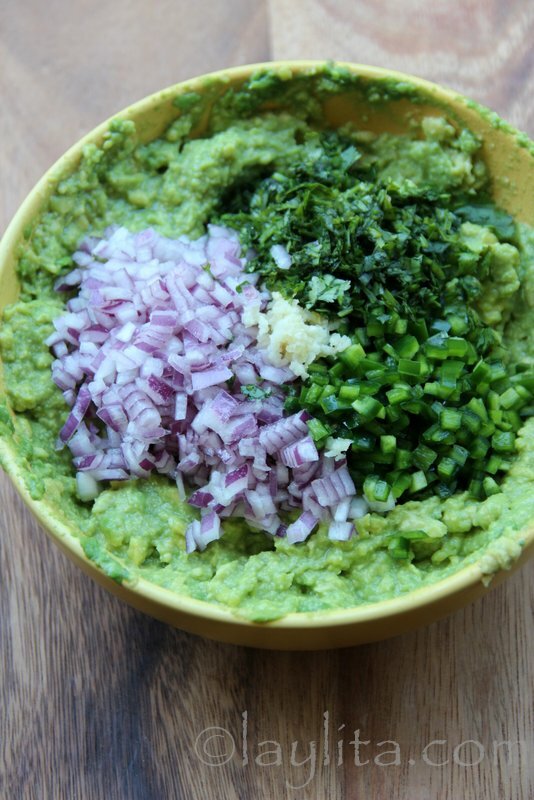 How green is that guacamole! A thing of beauty. HMMMM looks great – I make this all the time but have never added the serrano peppers – Love this addition to a household staple!! Yes, simple is better. This looks delicious! I don’t even need the chips, just a spoon! 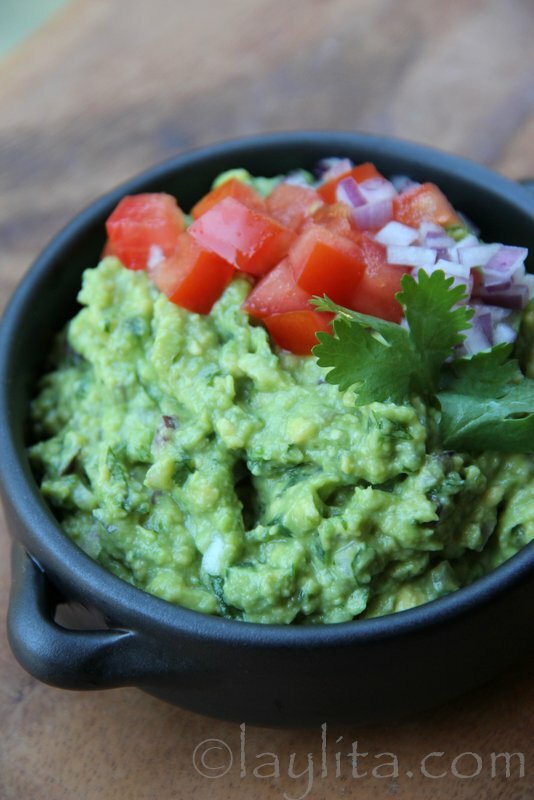 I am totally with you on the restaurant guacamole critique, one of my favorite tacquerias thins theirs out by adding shredded lettuce & still charges $5 – eek! Oh, yummy! That’s a dish I ADORE! So scrumptious!